Summer is the perfect time for me to read women's fiction. I find that I read a lot of light and fluffy books that appeal to me more because of the warm temperatures and the sunny skies. However, I also still enjoy the occasional serious and touching story -- one that really makes me think and feel. 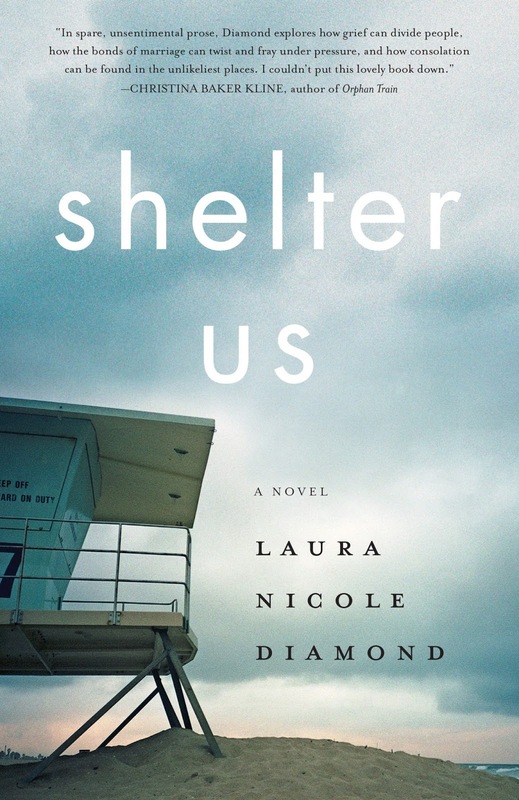 SHELTER US by Laura Nicole Diamond definitely fit the bit. This novel was beautifully written, although at times difficult to read; and I was very impressed with this new-to-me author. SHELTER US tells the story of Sarah Shaw, an ex-lawyer who is now a stay-at-home mom with two young sons. After losing her infant daughter, her life has been turned upside down. Her husband has turned to his work as a law professor, while Sarah struggles to get through her day given the grief she is experiencing. While on a walk one day, Sarah sees a young woman pushing a stroller who appears to be homeless. She can't get this woman and her child out of her mind so she resolves to find them and help. When Sarah is finally able to make contact with Josie, she becomes extremely involved in Josie's life; and they form a special friendship. As Sarah becomes more and more caught up in Josie's life, she discovers that she is willing to risk everything special in her life for her new friend. She begins lying and hiding things from her family and these deceptions just might end up causing Sarah to lose everything important in her life. SHELTER US is a poignant story about a two complex women. It explores many difficult subject matters like loss, grief, homelessness, infidelity, isolation, motherhood, marriage, and more; however, it also shows the important of friendship and love. I was very impressed with Ms. Diamond's writing style. Her prose was eloquent and her storytelling abilities were quite good. In fact, I'm not alone with my praise - the book was just nominated for a Southern California Independent Booksellers Award for fiction. One thing I definitely appreciated about SHELTER US was how Ms. Diamond chose to tell this story. The novel was told through Sarah's eyes and it was absolutely the way to go in my opinion. I loved how the author captured Sarah's voice and brought her character to life. By using first person, I felt as if I truly got to understand the desperation and sadness in Sarah's life; and I also think it made me more compassionate to her struggles and flaws. I also really enjoyed the messages in this novel. I haven't experienced much sudden loss in my life and certainly nothing even close to what Sarah went though; however, this book made me feel Sarah's grief. I appreciated how this book explored loss and the after effects of this tragedy. I also liked how the author chose to introduce a homeless mother to the story. Both women needed saving, albeit in very different ways, and their friendship helped "save" both of them. It won't surprise you that I am going to recommend SHELTER US to book clubs. This novel is ripe with themes to discuss, and the characters are so interesting that you will have no problem finding things to talk about. There is a reading guide available on the author's website with nine questions. The author is also willing to "meet" with your club! Some of the topics you might want to explore include marriage, motherhood, loss, grief, friendship, isolation, betrayal, homelessness, sacrifice, faith, adultery, and more. SHELTER US is a thought-provoking look at loss and grief. I recommend to fans of women's fiction. This sounds like a wonderful story and so relevant to today's society. Great review!